In the comparatively brief time since Oregon’s Willamette Valley was established as an American Viticultural Area (AVA), in 1984, the region has won a reputation, especially for its Pinot Noir, that borders on legendary. Over the last couple of days, I’ve been savoring a wine from Cristom Vineyards that illustrates in classic terms the basis of the mystique of northwestern Oregon. 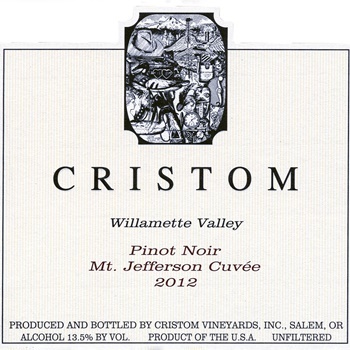 A 20-year-old enterprise that has carved its own prominent place in the Oregon wine story, Cristom produces seven different expressions of Pinot Noir, four single-vineyard wines and three bottlings variously blended from those estate-owned vineyards and grapes from other producers. The wine at hand, Cristom’s Willamette Valley Pinot Noir Mt. Jefferson Cuvée 2012, represents just such a comprehensive blend. 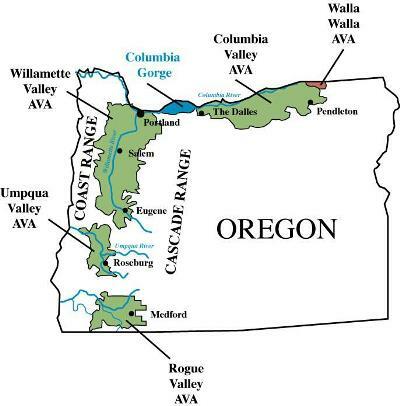 Oregon’s largest AVA, the Willamette Valley comprises some 5,200 square miles along the eastern and western sides of the Willamette River, extending from Portland in the north to just below Eugene. The valley climate is similar to that of Burgundy, the princely domain of Pinot Noir and a likewise elongated configuration positioned at a slightly higher latitude. Generally mild weather, with warm days and cool nights in the growing season, lends the Willamette Valley a close viticultural kinship to Burgundy. Cristom’s Mt. Jefferson Cuvée 2012 ($31) indeed bears a striking resemblance to red Burgundy from the regional core known as the Côte-d’Or. The deep red color foretells vivid aromas of strawberry and cherry. On the palate the Mt. Jefferson Cuvée displays medium body and fresh red fruit. Gentle tannins and a firm acid frame suggest this wine has real aging potential, though it’s so immediately appealing that cellaring seems more like a curiosity than a necessity. The finish is long, like that of a good Burgundy. Cristom’s Pinot Noir has another virtue in common with a typical Burgundy: a modest alcohol level of just 13. 5 percent. This is not Pinot Noir on steroids, but the genuine article, delicious, deeply layered, deeply pleasurable. 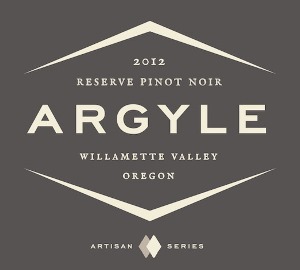 Another Willamette Valley gem worth seeking out is the Argyle Winery Reserve Pinot Noir 2012 ($34), a beautifully balanced wine with a striking flavor profile of dark cherry and a hint of vanilla. Light and vibrant, the Argyle Reserve presents a candy-apple red hue with aromas of cherry and clover. The Burgundy ideal tells here in a deceptive depth and complexity of flavors that belie the seeming delicacy of body and construction. This is a bracing Pinot Noir with energizing acid and forward tannins. While two or three years of cellaring probably would buff the wine’s aggressive edge a bit, that very aura of lively presence has its own charm. Perhaps a few bottles to drink and few to track as they evolve.